Physical therapy may be the non-surgical treatment for your condition or	part of your pre or post surgical treatment plan. 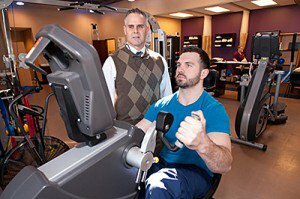 Physical therapy can	include weight training exercises, stretching, massage, and other specialized	treatments. The goal of physical therapy is to facilitate or bring about	your recovery, improve your function and range of motion and strengthen	your muscles. Our physical therapists work closely with patients and doctors	to create the best possible plan for you. MK Orthopaedics offers quality physical therapy in a warm and caring atmosphere. Our licensed physical therapists and physical therapy assistants have	years of experience. Our physical therapists work hand in hand with our	doctors to provide our patients with the most effective treatment. Physical	therapy is prescribed for a variety of conditions including over-use or	repetitive injuries, sports injuries, chronic conditions such as arthritis,	rehabilitation of post-operative patients and a work conditioning program	for all Worker’s Compensation patients. MK Orthopaedics provides physical therapy specific to the needs of each	patient. Treatment may include manual “hands on” therapy,	joint mobilization, cervical and lumbar stretching, therapeutic exercises,	and patient education on posture and body mechanics. To contact our Physical	Therapy Department please call:	815-272-2552 .